Here's some unalloyed good news about Ukraine: UEFA, the governing body of European football, has confirmed that four Ukrainian cities, along with four in Poland, will host the finals of the Euro 2012 European football championship, with the final to be held at the Olympic Stadium ( formerly known as the Red Stadium, Stalin Republican Stadium, Nikita Krushchev Stadium and Republican V I Lenin Stadium) in Kyiv. 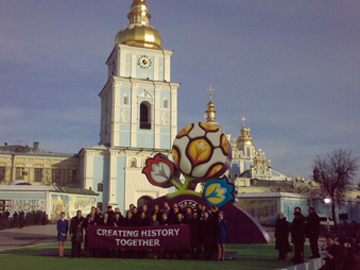 To celebrate the award, a ceremony is held in the splendid environs of St Michael's Square in central Kyiv on 14 December to unveil the new UEFA 2012 logo, together with the slogan "Creating History Together". I like the logo, which symbolises "two lands of growth": like all the best logos, it has something pleasingly unsettling about it, somewhat resembling a triffid. There's a press conference in Ukrainian, English, French, Polish and Russian attended by Michel Platini, where someone notes that there are now "906 days to go". This is followed by a pop concert on Independence Square. The latter shows Ukrainians to be a hardy bunch, since the temperatures are around minus 10 degrees Celsius. The decision is certainly something to celebrate. 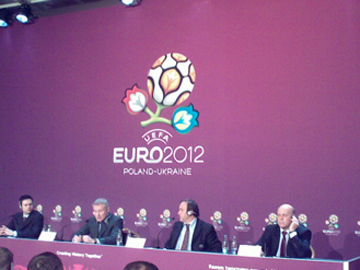 The tournament offers a huge opportunity for Ukraine to show the world what it has to offer (2012 will be a big year for sport of all kinds what with the London Olympics, and the UK will be providing help to Euro 2012 on policing and stadium security as well as private sector investment). But it's a challenge too - although work is steaming ahead on stadia, infrastructure and accommodation, much remains to be done, and first impressions will be vital. Now UEFA has made its decision, and it's up to Ukraine (and Poland) to deliver an unforgettable set of European football finals. "Creating History Together" is an admirable slogan. Go for it! And let's hope Northern Ireland, Wales, Scotland and England all qualify to take part.